Este artigo é sobre the event. Para the book, veja The Battle of Red Mountain. The First Council was held together for hundreds of years thanks to the friendship between Dumac and Nerevar. However, through means lost to history, Lord Voryn Dagoth of House Dagoth learned of a Dwemer scheme: deep in the bowels of Red Mountain on the island of Vvardenfell, the Dwemer had found the Heart of Lorkhan, and High Craftlord Kagrenac planned to harness it and use it to power a giant mechanical god. Lord Dagoth reported this to the Chimer leadership, and eventually, the Hortator Nerevar confirmed it with his patron Azura. Nerevar confronted his friend Dumac, and they quarreled bitterly (some sources assert Dumac did not know of Kagrenac's plan at the time and thus misunderstood Nerevar's concerns). As a result, Nerevar led the Chimer to war in order to stop this "profane" usurpation. At the start of the war, Dwemeri forces were concentrated in the northwest of the province, and their campaign initially had great success throughout the north. There's speculation that many of the great metal automatons the Dwemer used as troops in the battle were built in the Great Workshops of Nchardak on the island of Solstheim. The coastal Dwemeri city was reputedly able to produce one automaton a day, an apparently impressive rate of production. Many westerners were at the battle, notably Orcs and Nords, and sources often designate them as allies of the Dwemer. Nerevar, meanwhile, led his united people, the nomadic Ashlanders as well as the Great Houses (House Redoran, in particular, likes to trumpet its substantial contribution of warriors to the battle). Nerevar did not have full control of the Chimer forces until a series of defeats convinced the Great Houses to relinquish command. Once he had full command of the Chimer forces, Nerevar carefully orchestrated a confrontation at Dumac's citadel, a great Dwemer stronghold within Red Mountain where the Heart was being kept. The bulk of Nerevar's troops left Narsis and headed north at roughly the same time as a horde of westerners entered Morrowind from the west and began crossing the Inner Sea. Some sources claim that all who opposed Nerevar's forces in the battle were exterminated. Others state that while all enemies of the Chimer forces were decisively defeated, only the Dwemer were wiped out completely. Vivec's account in The Battle of Red Mountain is the only one which is both firsthand and substantial, though it conspicuously fails to recount certain key elements, such as the death of Nerevar (other sources are used here to supplement Vivec's narrative). According to Vivec, many of the Dwemeri forces were lured out of their secured stronghold at the start of the battle and pinned down by the Chimer thanks to Nerevar's contrivances (other sources mention the aid of Ashlander scouts and the efforts of Almalexia, Nerevar's queen). This is almost the only information available on the events outside of the mountain during the battle, even though it was where the bulk of the fighting took place. Nerevar left others to command the assault outside while he took a small party, including Lord Dagoth, to the Heart Chamber, the center of Dumac's citadel. While Vivec would only attribute their entry to "secret" means, at least one source claimed an act of treason permitted them to enter. Inside the Heart Chamber, they met and fought with Dumac and his guard. According to Vivec, Nerevar and Dumac fought each other directly, and both fell from terrible wounds. Here, the stories diverge. Vivec's private remembrances were part of the Apographa, or hidden writings, of the Tribunal Temple, and they bear some discrepancies with the Heirographa (priestly writings; the public, orthodox doctrine of the Temple). The Heirographa and some other sources claimed that Nerevar, with the aid of Azura, destroyed the Dwemer, while Vivec claimed it was Kagrenac's own folly which brought about their demise (though he was evidently not present at the time). The Heirographa also did not recognize Kagrenac's Tools or the Heart at all, instead claiming that the Tribunal "achieved divine substance through superhuman discipline and virtue and supernatural wisdom and insight". According to Vivec, Kagrenac used his Tools on the Heart out of desperation in the heat of battle soon after Dumac fell, causing all known Dwemer then on Nirn to disappear. However, the Tools remained. Lord Dagoth recommended their immediate destruction, but Nerevar wished to consult with his other counselors, so he entrusted the tools to Lord Dagoth and had himself carried out to the Tribunal on the slopes of the mountain. According to Vivec, they recommended to Nerevar that the Tools be preserved in case the Dwemer returned, but upon their return, Dagoth Ur refused to relinquish the Tools. He seemed to be behaving irrationally (Temple intelligence would later conclude that Dagoth Ur inexplicably adopted the views and motivations of Kagrenac). Nerevar and his guard resorted to force, and when the battle was over, Dagoth Ur was gone, presumed dead, Nerevar was dying, and the Tribunal had the Tools. One source of disagreement in the accounts of the battle is the role of Dagoth Ur. 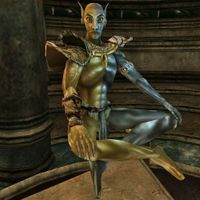 Vivec's account does not suggest Lord Dagoth was anything but loyal to Nerevar up until the former's treasonous refusal to relinquish Kagrenac's Tools in the Heart Chamber. And, as discussed below, at least one version claims Lord Dagoth was Nerevar's most loyal companion. However, other sources treat House Dagoth as having openly aligned with the Dwemer at the time, asserting that House Dagoth was a more "secular" organization which apparently did not want to go to war with the Dwemer over Numidium, which is difficult to reconcile with any of the more detailed records of what transpired. The stories of the Ashlanders, which were handed down within the tribes and mostly recorded in the Apographa, paint a very different picture of the battle. 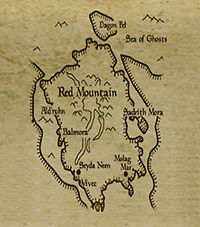 First of all, Ashlander tradition "does not place the Tribunal at Red Mountain", which may be meant to refute false claims in the Heirographa that the Tribunal were present in the Heart Chamber at the height of the battle (writings in the Apographa based on Ashlander accounts specifically mention the Tribunal being outside the mountain when the Dwemer disappeared). Most Ashlander stories hold, as Vivec's does, that the Dwemer destroyed themselves and that Nerevar left Dagoth Ur to guard the mountain while he went to confer with the Tribunal (at least one Ashlander myth asserts Dagoth Ur killed Kagrenac and a dying Nerevar summoned Azura to help him destroy the Dwemer). However, the Ashlander stories go on to accuse the Tribunal of poisoning Nerevar at the conference before confronting a defiant Dagoth Ur within Red Mountain, and when he would not yield, they drove him beneath the mountain and stole their divinity. Ashlanders attribute this story to Alandro Sul, the shield-companion to Nerevar remembered as the immortal son of Azura, who went to live with the Ashlanders following the battle. Nords, Orcs, and even Khajiit have their own legends of what happened at the battle. While they raise as many questions as answers, they offer greater understanding of the events outside the mountain during the battle and the tactics that may have been employed. Many sources speak to the presence of the Dwemer's "Western allies" during the battle, though in practice it seems the outlander hordes battled Dwemer and Chimer alike. Nordic legend recounts their ancestors' desire to intervene in the war and reclaim Morrowind from the "devils" (Chimer), but they were reticent to intervene without a strong leader- that is, until the "Devil of Dagoth" (Dagoth Ur) came to them under a flag of peace. He told them of the Heart of Lorkhan (or Shor) and its role in the ongoing war. They trusted that his betrayal of his countrymer was genuine, as treachery was common among the Chimer. Naturally, the Nords wanted to reclaim Shor's Heart, but lacked a strong leader which could rally them for such a campaign. In a miracle attributed to Shor himself, Wulfharth, the Ash King, returned to lead the Nordic armies, and he forged an alliance with the Orcs to further bolster their ranks. Wulfharth, along with Dagoth Ur, led the Nordic and Orc forces into Morrowind, although in accordance with the great Nordic oral tradition, accounts differ on what transpired. The "orthodox" tale declares that the whole thing was a ruse, that the Heart was a lie, and that the united Chimer-Dwemer forces lifted up the mountain, crushed Shor underneath it, and slaughtered the Nords. Wulfharth managed to kill Dumac and curse his people, but was "blasted [...] into Hell" by Vivec. The other version of the story (dubbed the "Secret Song of Wulfharth Ashking" by the Nords) confirms the presence of the Heart of Lorkhan and goes into greater detail regarding military maneuvers leading up to the battle: the Nordic forces traversed mainland Morrowind and began crossing the Inner Sea to reach Vvardenfell while the Chimer forces were still leaving Narsis, in the middle of the southern mainland of the province. Dagoth Ur purportedly confessed that he had been sent by the Tribunal, who were betraying Nerevar's trust so that they might ensure the peace with the Dwemer would be broken, evidently believing that the peaceful coexistence with the Dwemer and pursuing the Velothi way of life were mutually exclusive proposals. Dagoth Ur proffered the Tribunal's subversive efforts as the reason for the Chimeri force's sluggish advance to Red Mountain. The Nords have their own unique account on what occurred at the battle, which is uncorroborated and contradicts other accounts. Their ancient songs claim Nerevar, his shield companion Alandro Sul, and Dumac, all armed with a Tool of Kagrenac, fought together against Wulfharth and Lorkhan, with Sul and Dumac acting as Nerevar's champions. While Wulfharth and Sul fought to a standstill, Dagoth Ur attacked and killed Dumac. Nerevar then slew Dagoth Ur for this betrayal, and Lorkhan used the opportunity to deliver a mortal wound to the Hortator. Nerevar managed to finish off Lorkhan before dying. Khajiit still tell their pups of Dro'Zira, a mad Khajiiti warrior and an old ally of Wulfharth, who answered the Ash King's call to arms. The tale claims Dro'Zira acted as the Ash King's war mount and helped him in his fight against Dumac. Besides the fact that one version of the Nordic legend mentions Wulfharth fighting Dumac, the Khajiit tale is not corroborated by any other source. Dagoth Ur himself recalled, in a short letter addressed to Nerevar, that "beneath Red Mountain, you struck me down as I guarded the treasure you bound me by oath to defend. It was a cruel blow, a bitter betrayal, to be felled by your hand". If taken to be true, it would contradict the Ashlander chain of events (if not the events themselves), but could partially corroborate both Vivec's story as well as one version of the Nordic narrative. Dagoth Ur was presumed to have died (except in Ashlander stories) until nearly the beginning of the Third Era. Nerevar's lieutenants Vivec, Almalexia, and Sotha Sil rose to power amongst the Chimer. Within a few years, they would successfully use Kagrenac's Tools to become living gods, leading the Chimer to transform into the Dunmer. They manipulated preexisting ancestral and Daedra worship into the Tribunal Temple dedicated to their worship, and concealed the truth of how they gained their divinity. House Dagoth was branded as a nest of traitors, and its members were killed or incorporated into other houses. With the Dwemer gone, the Dunmer laid claim to all of modern-day Morrowind and their divine protectors kept them autonomous and relatively happy for millennia. The Heart of Lorkhan remained in the mountain, and the Tribunal would return to it annually to refresh their energy. The Ashlanders, who refused to accept the Tribunal, returned to the ash wastes, where they passed down very different accounts of the battle and its villains. Red Mountain erupted around this time (the year of Sun's Death, the first eruption of the mountain, occurred in 1E 668), though it's not clear if this was just before, during, or soon after the battle. 2. The inference that there was a Battle of Red Mountain in 1E 416, preceding the 1E 700 battle, is based on reading Five Songs of King Wulfharth in harmony with the other sources provided. Among other contextual clues, parts of Five Songs take place circa 1E 500, but mention the Greybeards and High Hrothgar. If Jurgen Windcaller did not form the Greybeards until after the 1E 700 battle, this would not appear to comport with the historical narrative established by the other sources. However, this may not be reliable due to the apocryphal nature of Five Songs, and the potential ramifications of a Dragon Break surrounding the battle. ^ The Etched Tablets of High Hrothgar. ^ Neloth's dialogue in Dragonborn. ^ Yagrum Bagarn's dialogue in Morrowind. Esta página foi modificada pela última vez à(s) 14h01min de 23 de novembro de 2017.